The property is suitable for rental to couples and families who would treat it as their own and in return we offer a high standard of service and facilities. The townhouse is situated near the end of a group of similar properties which share 2 well maintained communal swimming pools and is located in a quiet and secluded part of the complex. 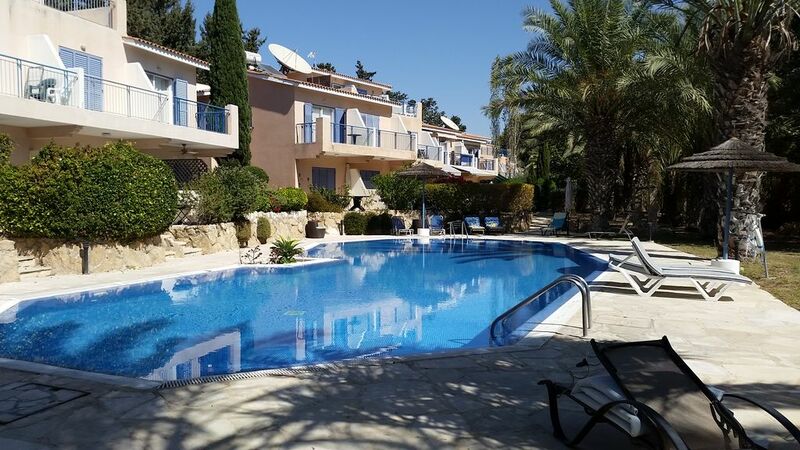 Paradise Gardens IV is a short distance, some 15 – 20 minutes steady walk from the nearby restaurants, local bars, municipal beach and Paphos harbour, and 20 minutes drive from Paphos International Airport. This property is a quality new build with good landscaped communal gardens and 2 large swimming pools. Sun loungers and umbrellas are provided and are normally laid around the communal pools. The accommodation is set over 2 floors with the ground floor comprising of a shower/toilet, kitchen, lounge/dining area and outside patio area (partly covered) and the first floor comprising 2 bedrooms and the main bathroom. Family person who wants his guests to enjoy his property as much as he does when he goes with his family to Paphos. Quiet location within a well maintained complex with 2 pools available to relax around but within easy reach of the harbour, dining and night life areas. Upstairs: Main bathroom is fully tiled with a high quality matching suite comprising full size bath with shower and shower screen, toilet, large hand basin with mirror and an extractor fan. Downstairs: Toilet, small wash basin and a shower. Notes on accommodation: Air-conditioning units are installed for use by our guests. Normal, reasonable use is included in the rental price and any misuse or deliberate negligence observed and reported by our agents will result in the forfeiture of the booking deposit. Outside: The quiet complex has two well maintained swimming pools for residents use. There are a number of communal sun loungers available for use. The complex has well maintained gardens to enhance the look and feel of this prestigious complex. The windows and patio doors have blue anodised adjustable shutters for security and shade. Sliding doors from the lounge/dining area lead off to the large semi paved patio area with garden furniture (matching table and chairs). Cleaning / Towels / Linen / Maid service: Linen and towels (beach towels not included) are provided with clean linen and towels changed weekly. The property is cleaned prior to arrival and any additional cleaning visits are arranged and charged locally through our Paphos agents/friends. Ideal location and position within complex but a rather tired property. The property is deally situated in a quiet spot within the complex and in easy reach of local shops, buses, beach and is walkable to the harbour. However it is very tired and needs painting and a good thorough clean. When we arrived the outside chairs & cushions complete with petals from the patio were dumped under the stairs in the lounge with lilos, toys, ironing board etc and we unearthed a very dusty hoover from underneath the pile. It seemed that the property wasn't freshly cleaned although the bedding and towels were laundered. We were told to leave the property clean on vacating so assume it was as clean as the last people left it. Velcroed to the walls were notices telling us of the dos and don'ts some of them with childlike pictures of animals. We feel these would be better kept in a file for reference. The Agents looking after the property whilst very friendly couldn't advise us about the television and we waited a week for them to look at a faulty ceiling fan in he main bedroom which was not fixed during our month's stay. The new fridge in the kitchen was inefficient so milk had to be bought daily and there was no remote for the DVD player. The kitchen was basically equipped but would benefit from a few additions such as a sieve, measuring jug, oven trays and casserole with lid. We also waited a week for kitchen scissors. However the beds and linen were changed weekly and the Wi-Fi worked efficiently. Enjoyable holiday in Paradise Gardens. Enjoyed our stay at this apartment. Found the property to be clean and comfortable. Kitchen well equipped for eating in. Plenty of chairs and loungers for sitting out. Quiet location . Supermarkets very close to the complex and Pambi's Diner which is open all day - breakfast through dinner. Bus stop just outside the complex. The buses were very good and we made several trips to other parts of the island by bus. Very enjoyable holiday. Great accommodation, great location, 15/20 mins on foot to main tourist area and harbour. Bus, shop and pub/ diner within 500 yards. Two good pools. Private layout in garden patio area. Spent two relaxing weeks there. Everything that we needed was provided at the house. Would not hesitate in booking up again. The town house on Paradise Gardens 4 is in an good location within the complex, close with not onto the pool so can have peace when you're not at the poolside - having said that, the pool area was not too busy during our stay (end of June to the end of July). The apartment has all the basic items you will require for a holiday, including washing machine, full cooker, microwave etc, in the kitchen. There are a couple of sun beds to use on the ample patio or I guess could be taken to the pool if it's busy. The house was clean and tidy and since we were there for a long time we had a maid who came and changed the bedding & towels each week, which was very useful. The walk to the seafront is around 15 - 20 minutes depending on your preferred walking speed! There are two small supermarkets just outside the complex for small bits of shopping and a bar close (we didn't use the bar this time, preferring to go further afield in the hire car) Not going to describe Paphos as most people who use this site will already know! The one improvement I would recommend is wi-fi internet in the house, many apartments/houses now offer this and it makes a big difference. All in all a great break in a good location - our thanks to the owner. If you are hiring a car for your holiday, we recommend a day trip to Nissi Beach in Aiya Napa. The best beaches here have golden sands and crystal clear waters. The bars and restaurants are located close to the beach. There are many other activities offered including bungee jumping, jet skiing, banana boating and para gliding. Also recommended nearer home is Coral Bay, with a good sandy beach and shops and bars nearby. Paphos municipal beach is about 1.2km away some 20 minutes walk away. Car hire is not necessary, but to give you more freedom and flexibility then it can be a good choice. The Paphos area offers many water sports including boat para gliding, scuba diving and hired boat trips. Many of the local schools offer safety lessons before you begin your course, and can cater for families. A must do activity is the highly recommended Paphos Water park - fun for all the family! There are also tours and excursions all over the Island, with cruises to Egypt regularly during the week; bookings are made with local travel agents. With the largest number of facilities and attractions in Cyprus, the biggest family rafting ride in Europe and virtually guaranteed sunshine for every one of its opening days, it's no wonder that Paphos Aphrodite Water park attracts over 100,000 visitors each year. Young or old, swimmer or not, there's something for everyone! - a cool way to spend a hot day - at the Paphos Aphrodite Water park! Getting to the property: Drive on the main road out of the airport for approx 4.0km. At the T junction, turn left onto the main road - B6 - signposted 'Paphos 10km'. Continue on this road and after 8km you go through Geroskippou village with it's 2 sets of traffic lights. Continue straight on to the first major roundabout (Next & Ermes Store on RHS). Take first exit onto dual carriageway, sign-posted Kato Paphos. Continue on this dual carriageway for approx 700m and move into the right hand lane as you approach the traffic lights. Turn right into Giannou Kranidioti road and after 100m, take the first left turn into Taxiarchon. Continue on this road until you reach a shop 'Ellis Kiosk' on your left hand side. The next turning left is sign posted Paradise Gardens IV. Turn into this road and 100m down at the T junction turn left. The property is the 4th building situated in the second block of townhouses as the road narrows. Parking spaces are available around the corner.